Christopher Carelli: Yankees’ Tanaka gets start under belt; can he make 105 more? Yankees’ Tanaka gets start under belt; can he make 105 more? New York Yankees ace starter Masahiro Tanaka is the key to the success of the club now, in 2016 and beyond. He took a very small step Thursday night, tossing two spotless innings against the Atlanta Braves in his first start of spring. He needs to make about 105 more starts before the Yankees can truly take a breath. If Tanaka, 27, can come close to that 105 mark by the end of the 2017 season (figure 35 starts each year between spring and regular season), it means that his partially torn ulnar collateral ligament has held up. It is also likely that Tanaka prospered during the time period. When Tanaka is healthy, there is very little holding back his abilities. Tanaka looked just fine Thursday, albeit in 19 pitches. The idea of making it through the 2017 season unscathed is not arbitrary. After the 2017 season, Tanaka can evoke an opt-out clause in his contract. Understanding this is far down the line, but if Tanaka, who would be entering his age-30 season in 2018, has shown durability and continues to be a stellar pitcher to that point he could take the chance to cash in on another long-term deal with significantly more in guaranteed salary. Even then, Tanaka might not generate a ton of interest because of the ticking time bomb in his right arm. With the injury always present, it might make one wonder if the Yankees would jump at the bidding, or allow Tanaka to walk. If Tanaka chose not to opt-out he’d earn $67 million for the final three seasons of his seven-year deal according to Cot’s Baseball Contracts. The Yankees would surely be fine with that if Tanaka was indeed healthy and productive, but it could significantly increase should the right-hander choose to test free agency because his condition and performance are stable. This is the gamble Tanaka chose to take. Look at this the other way and presume the UCL will completely tear before the opt-out. When is it best to happen for Tanaka and the Yankees? It would have to be soon for both parties. Once the UCL requires Tommy John surgery, Tanaka would be out the minimal year, but up to 18 months. Let’s suppose the shorter stint going on his work ethic and general health otherwise. If it happens this season, he comes back at approximately the same time the following year. He’d have whatever time remained in the 2016 season and then 2017 to prove he was able to overcome the recuperation and more importantly retain his abilities. This is no easy task. Some players are able to undergo Tommy John surgery, come back and be very much the same pitcher they were before going under the knife. Others develop mechanical problems, and worse the elbow doesn’t hold up the second time around. The surgery itself is commonplace; how the reconstruction holds up and the subsequent performance of the player is not. If Tanaka was to display the same nasty splitter and the rest of his offerings are in line with what we have seen to date, there is a good chance he could parlay a very good 2017 season into another long-term deal, whether that’s with the Yankees or not. The Yankees would certainly stay in the picture under these circumstances. What if the tear occurs in the 2016 season? Again, it would have to be early, so that there would be ample time for Tanaka to demonstrate he’s the same pitcher in 2017. If it’s middle-to-late 2016, then he’s effectively worthless for 2017. Would a team offer him a large contract after seeing a month or two of pitching? It is unlikely, and would leave Tanaka to ponder if it is worth leaving the Yankees’ guaranteed money on the table. This last scenario burns the Yankees too. Assume Tanaka would not opt-out leaving the Yanks on the hook for the remaining three years of the contract. They would have nowhere to go, other than to hope Tanaka avoids a recurrence from 2018-20, or try to trade him if they are not confident in his abilities. Even worse for Tanaka and the Yankees is the complete tear happening at any point in the 2017 season. Tanaka, has no chance of opting out at that point, and the Yankees have a pitcher coming off Tommy John surgery with up to three expensive seasons left to pay out. Under those circumstances, Tanaka is not going anywhere, unless the Yanks were to eat some of his salary. These doomsday scenarios will never go away where it concerns Tanaka. He’s pitching with a partial tear. It doesn’t heal on its own. It is not disappearing. He and the Yankees have basically crossed their fingers wishing he can make it through 2017. At that point, there will be plenty of performance data and a fresh look at the tear requiring a big decision from the player and the team. If Tanaka cannot make it through 2017, he and the club should hope his elbow blows out sooner rather than later, so that an equally informed decision can be made for their respective futures for 2018 and beyond. 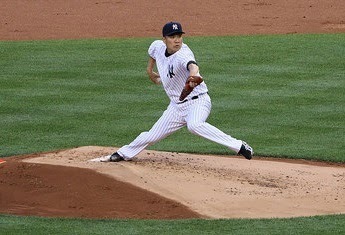 Photo of Masahiro Tanaka courtesy of Arturo Pardavilla III via Flickr.